Here are six suggestions as a Christmas gift guide for a French gardener in your life. Or for someone, who like me is not French, but who loves all things in French-inspired gardens. If you like to shop online, now is the time to order to make sure your purchases arrive in time for Christmas. Not only is the time it takes mail order to arrive an issue, there is also a possibility what you want to order may be sold out if you wait too long to order. The following things are some of my favorite gardening gifts. 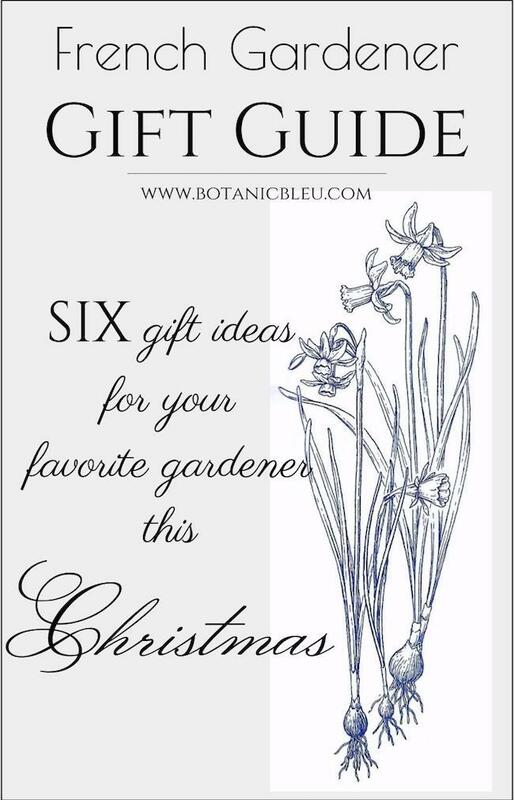 . . and are guaranteed to be some of your French-inspired gardener's favorite gifts, too. Included is a general price guide for each item, but prices vary depending upon your location, whether or not an item is vintage, and quality. Shipping and taxes not included in estimated price range. When buying bulbs, buy the largest size offered to insure the best quality bulbs with the best flowers. Shown are Ziva paper white bulbs. The one on the left is a 16-17 cm bulb. The one on the right is a 13-15 cm bulb. 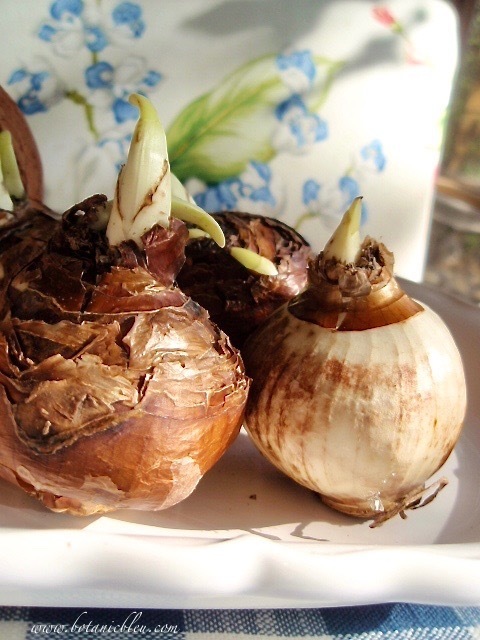 In the previous photo the bulbs shown in the French-style flower pot are being "forced" into bloom in time for Christmas. Those bulbs are 16-17 cm in size. 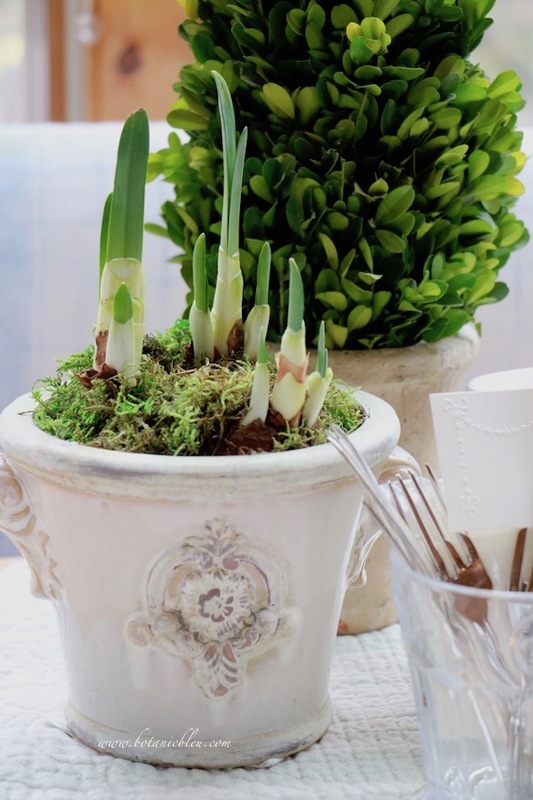 Each bulb has at least three flower stems and will produce several blooms on each stalk. Your gardener will love you for choosing the best quality bulbs possible. Thalia daffodils are among my three favorite daffodils. 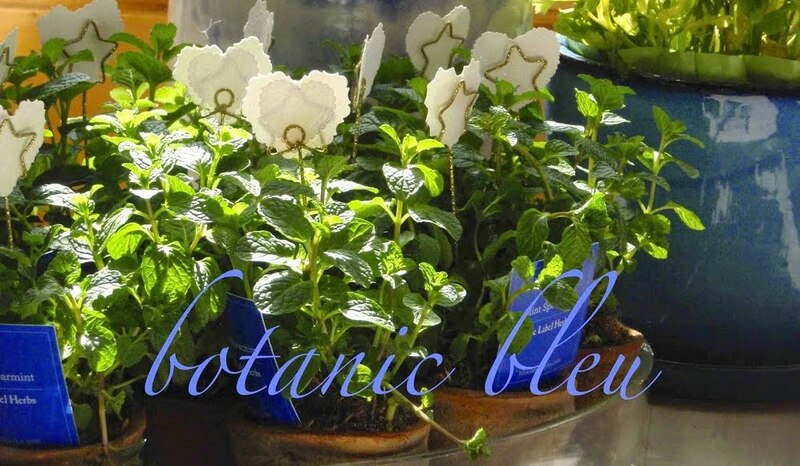 The flowers are pure white and have several blooms per bulb. In north Texas, they bloom in mid-March. 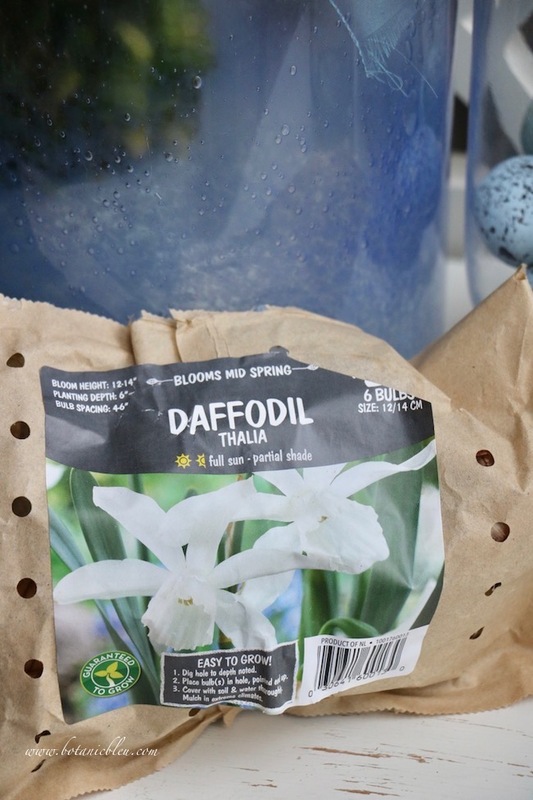 Last-Minute Gift Idea: Buy a pot of daffodils with buds or flowers from your local nursery or flower shop. 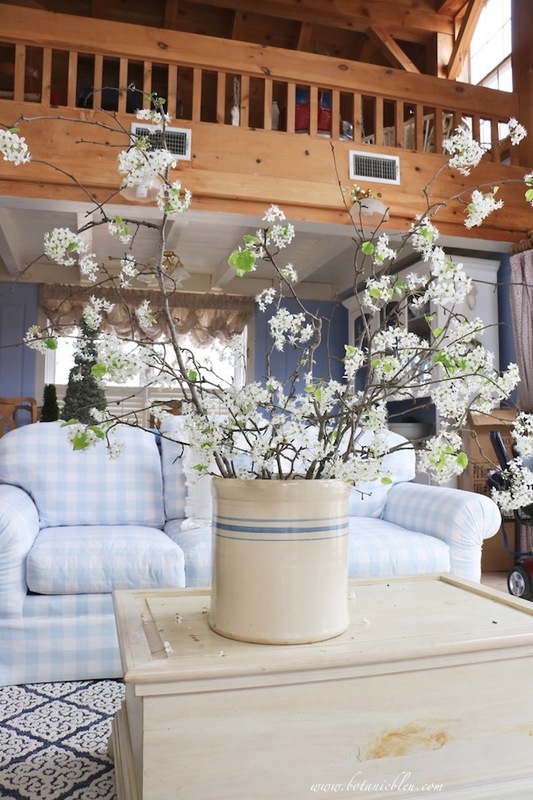 Not just any flower pots, but ones with French-style designs. These small pots are perfect all during the year and can be used over and over again. Don't we all love presents that can be used all during the year? 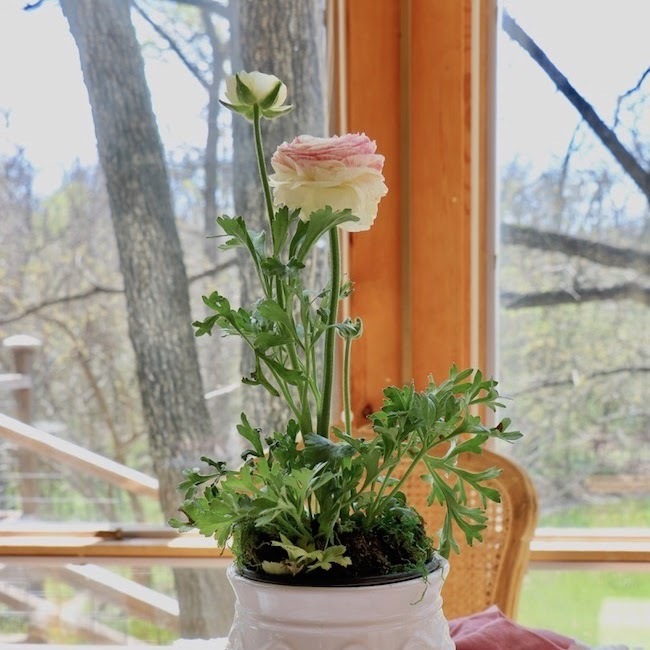 French zinc seed pots and red-clay rose pots are fun pots with a French connection. 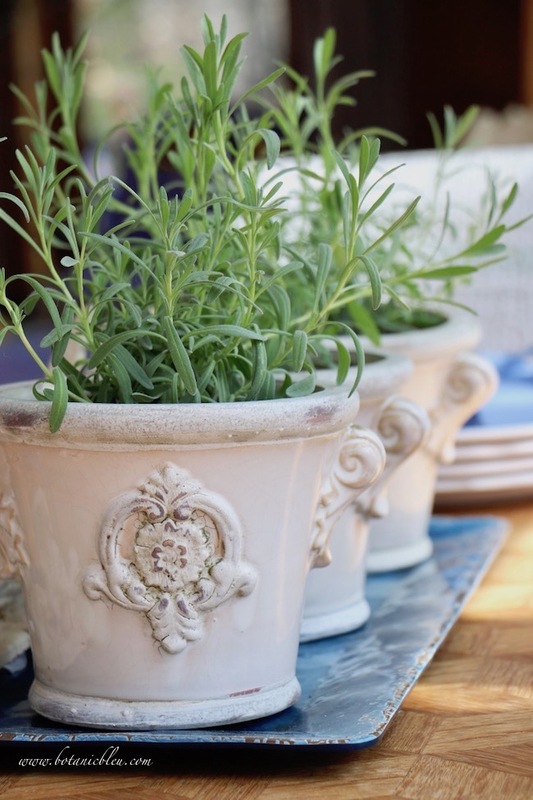 They are inexpensive, but are sure to delight a gardener who loves authentic French vintage pots. 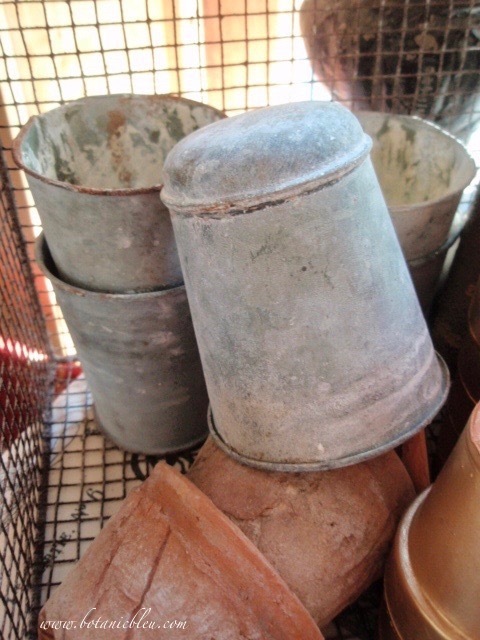 Found at Round Top Antique Fair, these little zinc pots were inexpensive. Sometimes zinc seed pots can be found online. 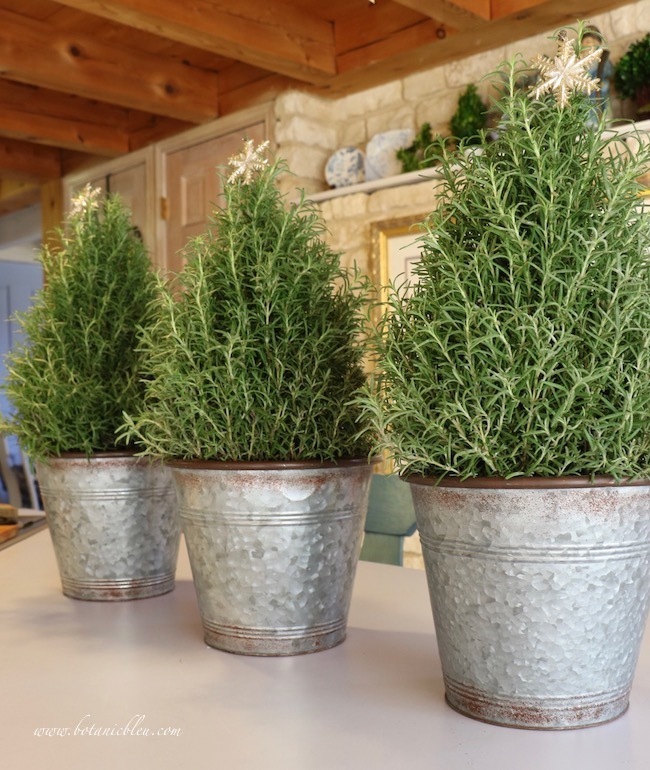 Fragrant rosemary trees in reproduction silver-colored metal pots make excellent Christmas gifts for the kitchen. A French-inspired gardener will love snipping fresh rosemary to add to French recipes all during the holidays. 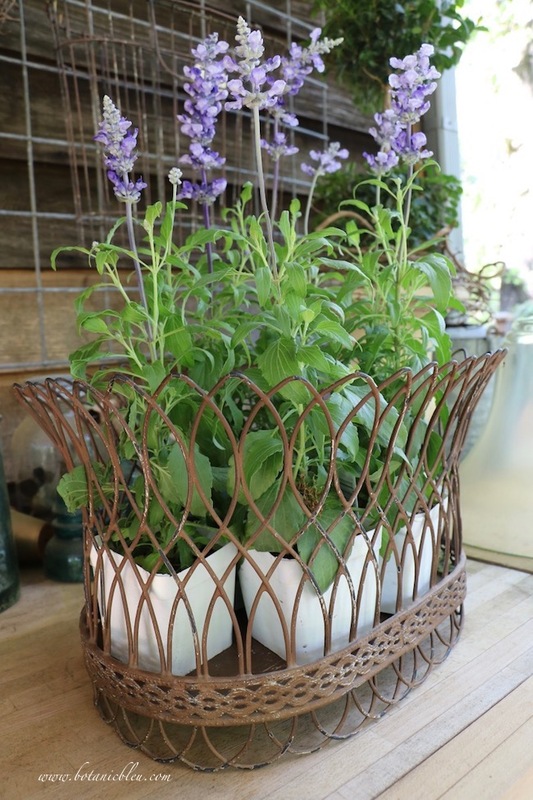 French wire baskets make bedding plants more beautiful, but can also be used around the house for more than flowers. Stacks of towels in the kitchen or stacks of hand towels in the bathroom are kept handy, but organized, in a French wire basket. At Christmas, fresh greenery with pine cones in a French wire basket add a fresh fragrance with French flair to any room in the house. My latest love is for French market/flower baskets on wheels. The wheels make transporting flowers, both potted flowers and cut flowers, easy. The basket can also be used to cart grocery purchases home . . . if you live near a grocery store. Right now, the market basket is holding a roll of Christmas wrapping paper. 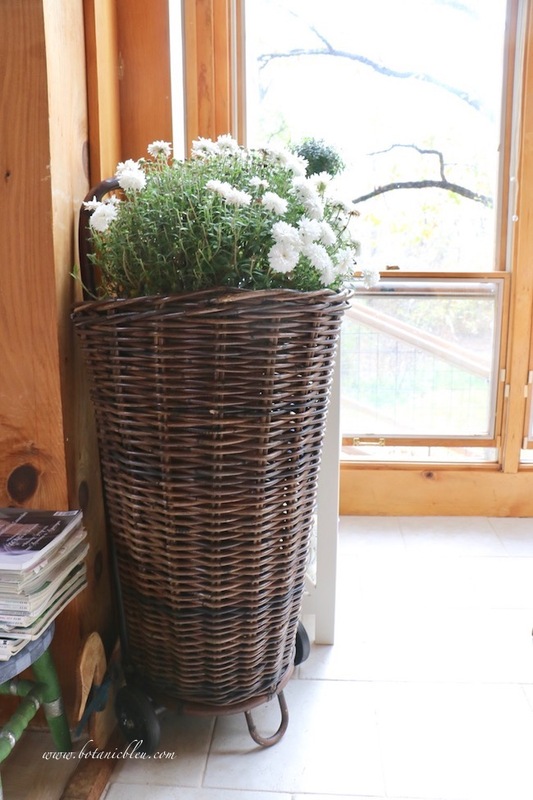 The basket is tall enough to keep rolls of gift wrap corralled without falling over. What about hauling dirty towels from the bathroom to the laundry room on wash day? Yes, your French-inspired gardener will love a French market/flower basket all over the house and throughout the year. Gardening cloches are for protecting tender plants from late frosts and were introduced around 1623. Cloche means bell in French. 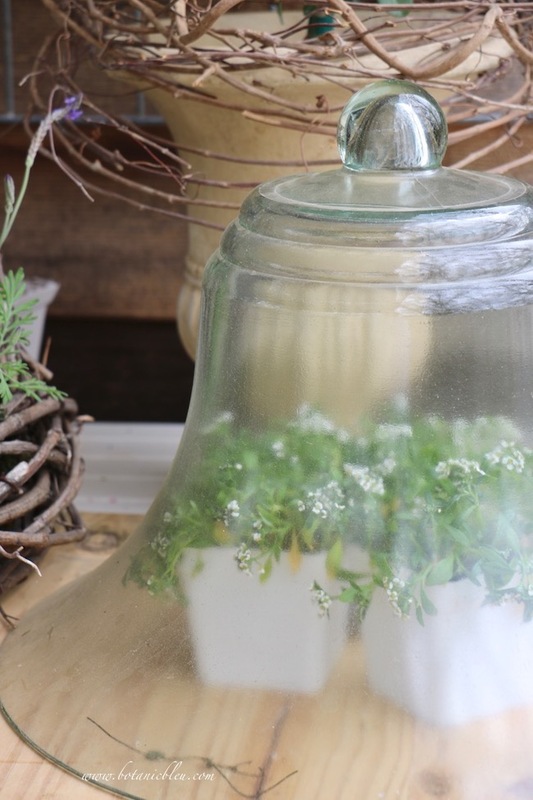 Today we use cloches for a variety of things including protecting food, but the authentic bell-shaped glass variety is sure to please any gardener. This green-tinted cloche came from an antique store in Franklin, Tennessee. Sometimes, antique cloches can be found on eBay. Scissors of any style are useful to gardeners, but the shape and feel of a gardening snip bring a smile to a gardener. These are designed to be used in gardening and, as a gift, tell your gardener you know his/her passion for gardening. 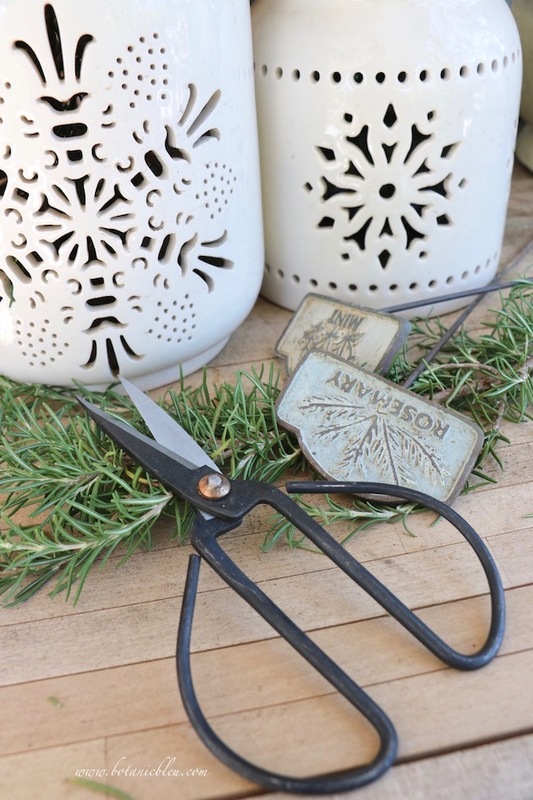 What about including gardening snips with your gift of a potted rosemary tree for the kitchen? Perfect for snipping rosemary for the French recipes. Flower frogs come in a variety of styles including metal and glass ones. 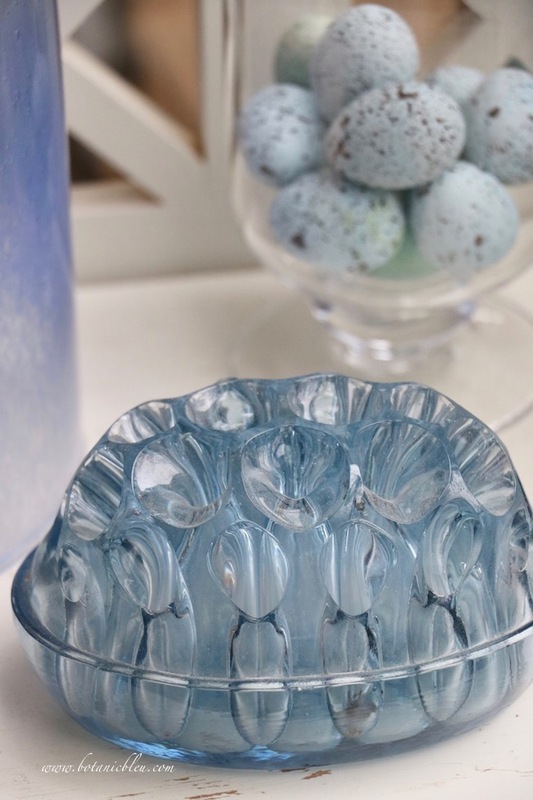 For French gardeners, this blue glass version would be a treasured Christmas present. My sister bought this flower frog at a Paris flea market as a Christmas gift for me the last time we were in Paris. What better gift for a French-inspired gardener than a vintage glass flower frog from a Paris flea market . . . in the recipient's favorite color, blue? PIN ⥣ to your Christmas ideas board. Which of these French gardener gift ideas are in your letter to Santa this year? 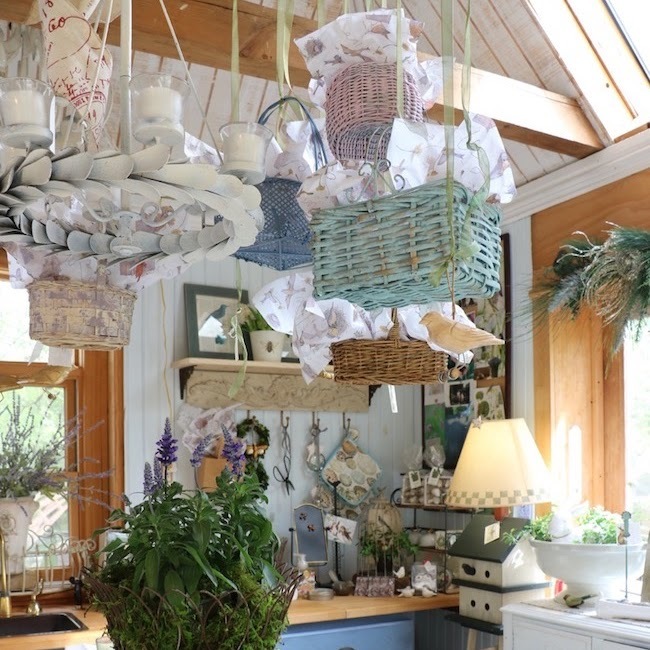 Flower pots, French wire baskets, a French market/flower basket, potted narcissus, and gardening snips can all be found in this year's French Country Christmas Event in my little garden house. 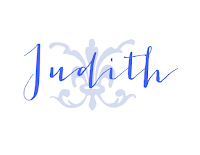 If you are in the Dallas/Fort Worth area, I would love to meet you. SEVEN Christmas Boards with holiday inspiration. You are bound to find some great ideas for your home. 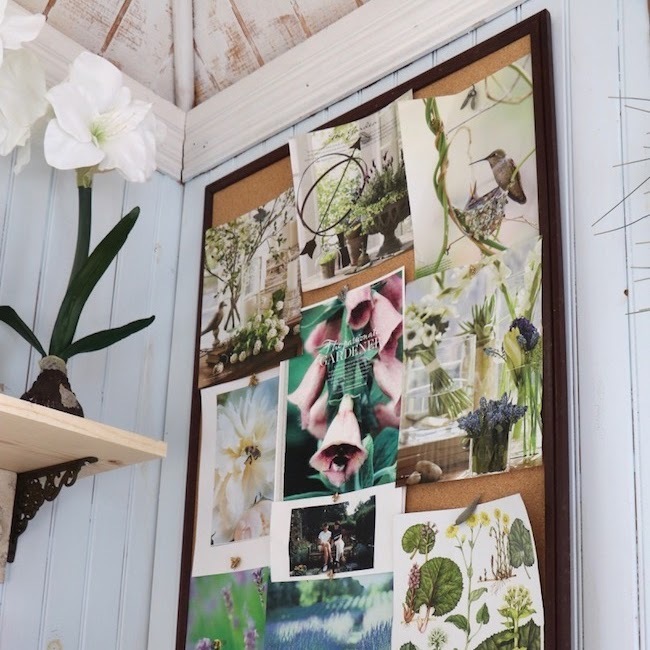 I would love for you to follow Botanic Bleu on Pinterest and Instagram. 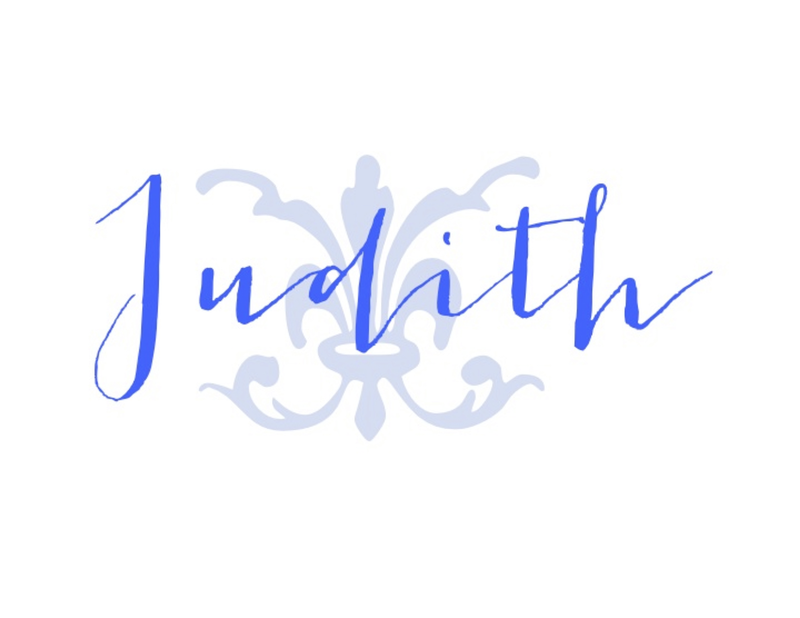 Beautiful suggestions, Judith. I bought the prettiest lavender tree today. Need to pot it up for the holidays. Wonderful ideas! I purchased a rosemary tree from the grocery just last week, and have the snips handy. 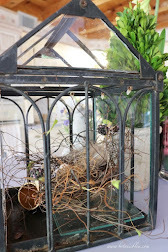 I'm using my antique cloche for a holiday display of one of my collections. Garden items are always a thoughtful gift for the gardener, and many are great also for repurposing! I would love to attend your French Country Christmas event. 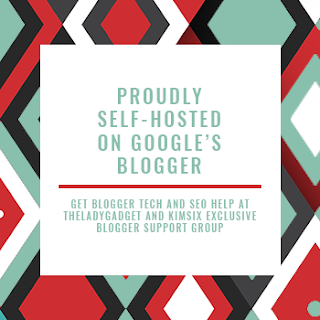 I hope you will share pictures on your blog of your show. So wish I could come. Oh I would indeed love any of these gifts! Thank you so much for reading Decor To Adore and for your many heartwarming comments and friendship.